I want to start off this post by saying that I'm amazed. Seriously! I've been an Aweber customer since 2008. The reason why I signed up is because it was the service my mentors (and so many other marketers) recommended. Words were used like “industry standard”. At that price range, there was “nothing better” in my mind because of what I had seen and heard. It became my autoresponder service of choice, and what I recommend to my audience. In my mind, I was recommending the best . . . Until I started REALLY doing my research. I was relatively satisfied with Aweber, until their recent changes to their dashboard. All of a sudden, I found myself struggling to figure out how to do some simple things in Aweber. I'm a relatively tech savvy guy, and if I struggle to figure these things out, I wondered how many people in my audience would have the same problems. So I started doing some snooping around. I ended up signing up for Mailchimp, ConstantContact, and GetResponse because I wanted to see what the competition was offering around the same price point. I eventually decided on GetResponse, so let's go ahead and dive into the features of GetResponse that put a smile on my face. I'm confident that by the end of this post, you'll understand fully why I came to the conclusion I did. The Autoresponder service, in my opinion, is the most important feature when it comes to email marketing. Someone signs up for your free ebook, course, or whatever, and they automatically get an email with that email. A week later (or whenever you choose), they get an automatic follow up that helps to take your relationship to the next level. Clicked: Imagine this – you send an automatic email to your subscriber on day 4, asking them if they would like to get this new free resource you created. They click on the link to get it. The day after you send another one saying “Hey, I see you went to download my awesome free report. Thanks for doing that. Hey, I created a video just to help people who downloaded it. You can get it here (INSERT LINK)”. Can you see how powerful this is? Yeah – I know. Beautiful. Opened: This is similar to the clicked idea, but based on whether they opened a specific email. Another beautiful thing. Subscribed: This one is simple. Someone subscribes, they get added to an autoresponder sequence. Goal reached: This feature is a cool one where you can set specific goals on your blog/website and if a subscriber accomplishes that goal, they get added to another sequence. Say for example they purchase a product and then get directed to the thank you page. Because they reached the thank you page, they can be automatically sent a message. Other factors: There are also some there features that you can tie an autoresponder to, like if they had a birthday (if you collect that data), changed their info, or if they were sent a specific autoresponder. Take home message: GetResponse allows you to setup automatic emails, not just based on time (like aweber), but based on the specific actions your subscribers take. This is similar to the VERY advanced features that Infusionsoft has, but much more affordable and user friendly. A few weeks ago, I got an email from one of my subscribers. She told me that she loved the content I was sending her, but really disliked the fact that she can hardly read the email because she checks her messages on her mobile device and always has a hard time reading my emails. She encouraged me to look into doing it in a more mobile-optimized way. Do you see what I see? No, your eyes aren't betraying you. As you type out your email (shown to the left), it also gives you a live mobile preview, showing you exactly what your message will look like on mobile devices. You don't have to guess, it's just right there. GetResponse shows you this in a very beautiful way so that you never have to wonder. Now tell me that doesn't make you happier than a starving man in front of a big meal? If you want to see it fully in action, watch this video. One of the things I decided at the beginning of this year was that this year would be a data-driven one for me. I make decisions based on the data I collect from my audience. I do this by creating surveys and sending them to my list. I currently pay $200/year for the ability to create an unlimited amount of surveys. Every time I see that $200 withdraw from my account, I feel a little bit of my heart being ripped out. Well, GetResponse gives you the ability to create surveys at no additional cost. Let me say that again – GETRESPONSE GIVES YOU THE ABILITY TO CREATE SURVEYS AT NO ADDITIONAL COST. Do you know what that means? My heart no longer has to be ripped out. I will live a longer, healthier life because of GetResponse. Ok, seriously – I hope you know when I'm joking. I won't live longer because of this, but I'm definitely happier now that I can get all of that data in the same place that I manage my list. Watch my video on creating surveys in GetResponse. I currently pay monthly for access to LeadPages. It's a great system for creating landing pages, and I love most of what it has to offer, especially in terms of measuring conversions. When I realized that GetResponse has similar features, I really couldn't believe it. You get this feature for an additional $10/month. Here's a sample of how it looks. You can move stuff around. With LeadPages, you basically get to plug stuff into their templates. With GetResponse, you have the freedom to move things, add things, and edit things directly on their template builder. You can't do this with LeadPages. You have FULL CONTROL over the design by being able to edit the HTML. You DON'T have to know how to do this, but if you are a more advanced user, you can completely rip the template apart and customize it to your heart's content. It doesn't seem that you can integrate it with other services like GotoWebinar, which is definitely one limitation, when comparing it to something like LeadPages, but for simple squeeze pages, it looks GREAT. Also, it's easy to setup the pages on their server, but for it to show up on your domain, there are a few additional things you need to set up that make it a bit tricky. I haven't fully decided if I will be getting rid of my LeadPages account as yet, because I need to do some more testing, but it's great to have this feature within my GetResponse account. I'll update you once I have a full conclusion. Mobile App – Where Have You Been All My Life? 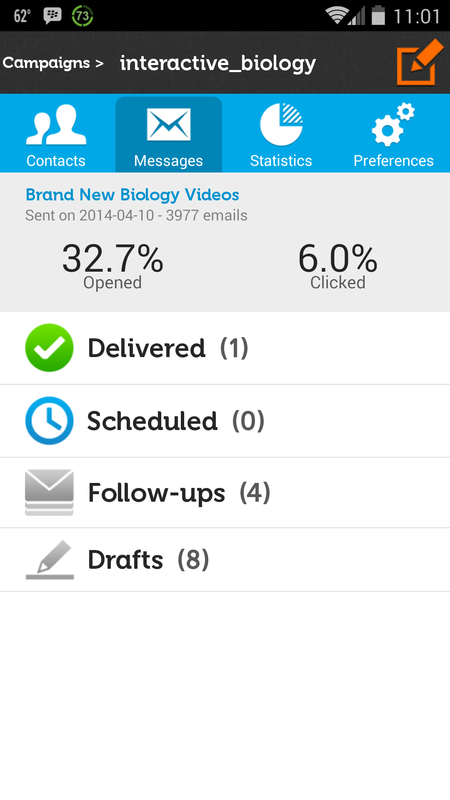 Wouldn't it be awesome if Aweber had a mobile app that you can use to manage all of your email marketing campaigns? You'd have the ability to create and send emails to your list and even check your stats. In this fantasy world, you and I could manage our most important assets on the go. Traveling? Not a problem. Unfortunately, this is just a dream, and we just woke up, logged into our Aweber accounts, and realized that this ain't happening. Well, with GetResponse, this is not a dream. This is reality. They have a pretty sweet iOS AND Android app that you can use to do just that. Check out that screenshot over there to the right. You can do all of what I mentioned above from the palm of your hands – it's a beautiful thing. Once I made the decision to transfer, the rest was relatively straightforward. I exported my list from aweber and imported it into GetResponse. Because of the size of my list, they had to go through an additional verification process where they accepted 4,000 contacts, had me send a test email to make sure I was legit and then they approved the full transfer. I made a video of the transfer process that you can watch to see how easy it was. If you were trying to move from any other service to Aweber, all of your subscribers would've had to opt in again, and you would loose a significant number of subscribers. This is not the case with GetResponse. They make it relatively easy to transfer. I'm gone. Aweber has been good to me, but I found someone better. GetResponse is the perfect blend of functionality, easy of use, and powerful features for what I'm looking for in an Email Marketing Service. With their time-based and action-based autoresponders, really cool inbox previews, survey functionality, landing pages and mobile app, I'm sure I'll be sticking with them for a while. I even went to the extent of creating a GetResponse Resource Center to help anyone interested in seeing all of their functionality in action. If you'd like to take advantage of all these features, go ahead and sign up for GetResponse. Make sure you let me know what you think once you try its awesomeness. Thanks Ben. I actually strongly considered Mailchimp and almost went with them. But, they have some stuff in their terms about affiliate promotions that make me weary. I actually have a friend who’s account was shut down because they did one affiliate promotion that Mailchimp didn’t like. And there was nothing Wrong with the type of promotion he did. Mailchimp just didn’t like it. Since that, I decided to stay away. Then I saw GetResponse’s features and it was a no brainer for what I was trying to do. Hey Leslie — this is a great review. I am thinking about switching now myself. I have also been on Aweber since 2008. Can you comment about the cost of GR vs. Aweber (maybe I missed it). Thanks for putting this together. I think you don’t take into account the cost of losing the old fees. I’ve 70,000 subscribers and Aweber charge me $89 a month. While If i switch to another provider I would have to pay the new fees which are around $450/month. So before switching i should give a lot of thinking at the idea. My 2 cents. Yep, I hear ya. However, most people I know aren’t on those older accounts. I’m not on those older accounts. However, you are also limited in terms features. You have to consider what’s worth more to you. With 70,000 subscribers, I would also be hesitant to switch if I were on that legacy account. But if you compare the fees now, GetResponse is actually cheaper. I also use GetResponse. Did a lot of research before I selected a place to start. I was previously using MailChimp but decided that to get all of the features I wanted and needed, the FREE version wasn’t the way to go. Great post Leslie! I also use LeadPages and have considered looking at this additional feature in GetResponse. Be sure in your testing that you look at load times, because that is what I hear a lot from the LP team in terms of a big benefit of their system. They have it optimized so well. Question for you however, I noticed you sent the email out via Infusionsoft. So what do you use InfusionSoft for vs what you would GetResponse for? It’s something I’ve been thinking about myself. Looking forward to digging into your site, as I’m a new blogger and really want to do it right!! I have two sites I’m trying to maintain / get started right now, so it’s a little overwhelming. Hi Libby, Yes I use Infusionsoft for Become A Blogger. I use GetResponse for my biology blog, which is actually my bigger blog. The reason I use InfusionSoft for Become A Blogger is because it’s an all in one platform, including Shopping cart, affiliate program, payment processor and a bunch of other things. It’s way beyond GetResponse, but also much more complicated. When I switched, I actually hired someone to manage it for me fully. It was just a bit too much for me to take on. Also, it’s cost prohibitive for most bloggers I know, because you have to pay $2K just to get started, but it does some amazing things. If you need, we can get together and talk about infusionsoft via Skype and I can go into more detail. Shoot me an email. Thanks Leslie! Will do! Would love to! Thanks for the offer! This is a very detailed post with facts to support your choice. I am using MailChimp now, but looking for another service. And you just provided me with the information l needed. Thank you. You are very much welcome Marcus. Glad to help! I have been using GetResponse for MANY years now, and love them. I love that you can create trigger campaigns as well where you can send emails based on links people have or have not clicked in your emails. It makes marketing more efficient. And now I don’t like you. You’ve been keeping this secret from me? That’s just mean! Pretty cool comparison Leslie, I want to try out GetResponse mainly because they offer multi-languages so my Spanish audience won’t get half-Spanish and half-English emails like they do on AWeber when they are first getting subscribed to my list. With this review I know for sure it will be a great decision, thank you! Hmm, that’s interesting. I didn’t know that Sergio. Thanks for pointing it out. These features are so awesome plus I love the ease of use. Maybe I need to get on this too! Thanks for sharing. Wow if i ever switch it will be because of this comparison. I have to say I was hacked off somewhat at how they jammed me for more fees when my subscribers increased. Actually, it increases with every service as you get more subscribers. Mostly because it takes a lot of server resources to provide email marketing services. Great post Leslie! I was convinced to make the switch after your Facebook thread, but procrastinating a bit. Now I will not wait any longer to switch from Aweber to Getresponse. One question though, in your autoresponder point above, you mentioned that you can set up a separate autoresponder for those who clicked on a link in a previous email. Can you set up an autoresponder for those who did not open the email? Also can you set up an autoresponder for those who opened a specific email but DID NOT CLICK on your link(s)? Great question. I was actually curious about that. Unfortunately, it’s only if they take a specific action, not if they didn’t take a specific action. However, you can segment your list based on whether they didn’t do something and email them very easily. When you go to your message it shows you who did and who didn’t open or click, and from right there you can click on “Email this segment”. It does that a little easier than Aweber does. In Aweber, you have to go to Click or Opened, then go to those who did, or who didn’t, and from those screens you can email the segments. In GetResponse, it’s all on one screen and you just choose. This is good to know, thanks again. Leslie, I can’t tell you how much I appreciate your very thorough review of GetResponse. After the problems AWEBER was having, I was looking for an alternative, too. I really like EMMA, but it is much pricier for the same product. I’m ready to drop aweber, too. Tnanks for doing so much of the research work for me!! Hmm, I’ve actually never heard of EMMA, but yes I just checked and they are more expensive. You’ll definitely like GetResponse. Awesome review! I was using Aweber then switched to Mailchimp. I will definitely try using GetResponse. Thanks for the post. I tried aweber and Get Response at the same time a few months ago and aweber really came up short on support. I couldn’t get links into my emails and they said it was my computer (and more). That was that, he said, he couldn’t help me, so I left it. I went with Get response and their support has been amazing (and I need a lot of it). You wrote about several things I haven’t looked at yet. There is a huge learning curve (for me) so I call a lot. There is a lot of training for aweber including yours, so I wasn’t sure if I was going to have good luck. This post tells me that it all worked out for the best. PS. I thought mail chimp was not for affiliate marketers. You’re welcome Mary. Mailchimp is not best for Affiliate Marketers. They even have that in their terms. So that’s also another factor. I will be looking forward to that. They really do have to work on their training videos. I hope you are doing well with all your new changes. Really appreciate you! Thanks for the detailed post Leslie. I wasn’t aware and I will certainly check out the comparisons! You’re very much welcome Rohan! This is so interesting to me that you changed over to Get Response, because yesterday I got an inspiration to look into Get Response. The price point is better for those of us who still have a small email list. The main reason I wanted to change was that Get Response looks good on any device. I do a lot of work on my computer, but I check out emails on my iphone…. probably a lot of other people are doing the same. Change can be a hassel… but I’m going to do it because you trust it, Leslie! PS: I hope Noah is better now! The price point is better, and yes it does look good on any device. It’s definitely a better product in my opinion. Thank You Leslie – I have been looking for the perfect solution and have now found it!!! Was a user of Aweber & Campign Monitor but now am a GetResponse user!! Thanks, this is perfect timing. I just canceled my husband’s Aweber account for the same reasons you mentioned above and was working to get him set up with MailChimp. Now I’ll check out Get Response too. Just kidding, but I’m glad to help out! Interesting features, though I can’t say much about Aweber, I’ve switched to Mailchimp 2 years ago. 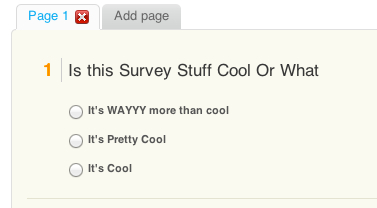 Mailchimp is pretty decent too. Leslie – i haven’t even started a company or a blog yet, but i soooo appreciate all the value you give in your posts! This is great information, because I probably would have started with Aweber, as well, simply because it’s the one I hear about the most. Thanks for your research and great detail in posting your findings! You are very much welcome Debbie. I think this something worth looking into. I had never heard of GetResponse. How well does it work with WordPress? Are there widgets available for it? I am currently using MailChimp. It does what I need it to do. I wouldn’t mind switching as monthly income increases. Thanks for taking the time to review this. GetResponse integrates just as well as Aweber and Mailchimp with everything. They all pretty much just use a form code. I don’t tend to use widgets for integrating my list with wordpress. I do use plugins like Opt In Monster. And I have a custom designed opt in form. Thanks for the review Leslie, appreciate you sharing your insight. Very helpful! If anyone is looking for a way to do a salesletter in which your company is being compared directly your competitor’s, without creating the bad taste in the mouth of your prospects that often comes with you sounding like your bragging and bad mouthing another business, this is it. Find a champion completely separate from your company who is succeeding with your product or service and have them tell their success story in their own words – while giving direct context of their experience with your competitor. This way you don’t have to feel awkward bragging about yourself and you don’t have to bad mouth your competitors but you get the maximum benefits that only come when a third party is doing so. Haha, thanks. Yep – I’m a believer, so I promote. That’s the way to get people to promote your stuff. Be awesome, and valuable. Thanks for a great post on making the transition from Aweber to GetResponse. I’ve been on the fence for awhile now and you firmly “Pushed,” me over…lol. I concur with all of your findings and I appreciate you pointing out even some of the shortcomings. It just proves the point that no one product is perfect. You have to take what you can and fine tune it for your purposes. I will be using your Affiliate link for GetResponse and I hope to be on the webinar call next week. I appreciate your transparency and your podcast as well. Keep up the great work and I’m excited about your transition from the University. God definitely has great things in store for you. Well hello Leslie, I did compare Aweber and GetResponse earlier this year and found GetResponse to be less user friendly however I did not at that time see many of the features you mention so I guess they have rolled out these fairly recently. Thankfully Getresponse do have a months free trial so with a little bit of planning we can really test their service to see if its worth the pain and the risk of losing subscribers during the transfer from the service that for the most part works well enough. Previously I was using Trafficwave, it’s terribly bad, and now I am using Aweber, I found that it is quite user-friendly, so far so good. 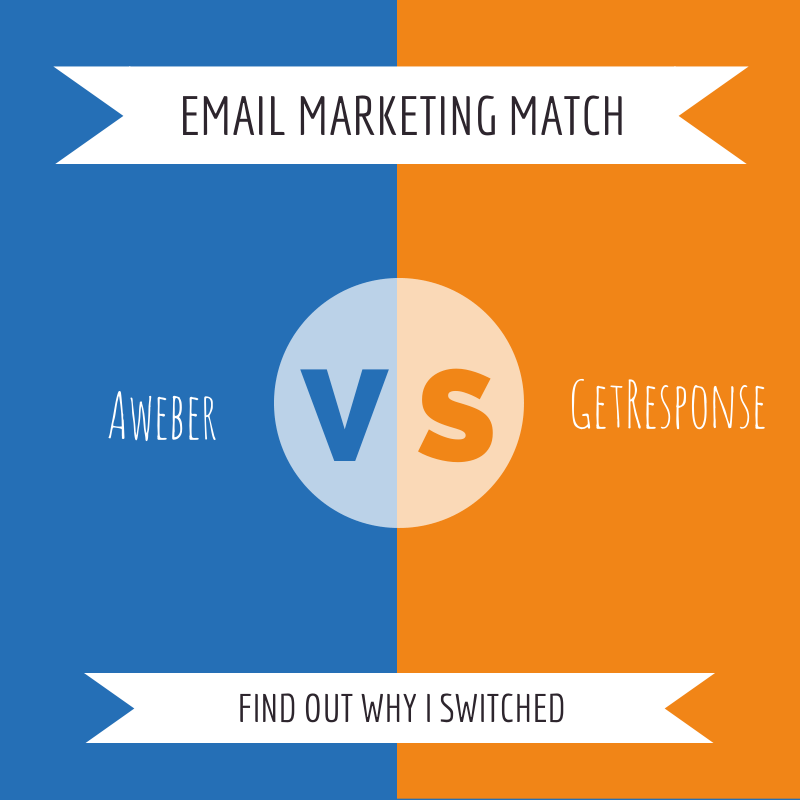 Yeah, Aweber is decent, but I think GetResponse is much better. Thanks for providing very interesting information to me, it is good product. But I do not much more about aweber. Thanks for the info Leslie. Perfect timing, because I needed to sign up for an autoresponder today. You made me decide for GetResponse! Appreciate your resource center for it too. Glad to use your link for my purchase! You won’t regret using GetResponse. Their system is great. Hi Leslie – great information and your comparison chart is quite comprehensive. Have you looked at Office Autopilot – now Ontraport? I’ve looked at Ontraport but not extensively. They are comparable to Infusionsoft and more than I need at this point. I had just switched over from Aweber to GetResponse as well, Leslie. I find the pricing for GetResponse is slightly cheaper. On top of that, I really need to use the “Time Travel” feature from GetResponse where this feature can be found in MailChimp as well but not on Aweber unfortunately. Awesome. Wishing you all the best with your list. Hi ! Leslie , I have a big question for you … Many friends are recommend me http://www.benchmarkemail.com/ , but I have in mind buy , GET RESPONSE , so now Iam little bit confused , have you ever try benchmarkmail? Hi Alberto. I’ve actually never heard of Benchmark Email so I can’t really comment on it. All I can comment on is what I use. I LOVE GetResponse and that’s the one I create training material for. That way I can help out my referrals as best as possible because it’s what I use. Just used your links to replace MailChimp on http://SavingsAngel.com and http://MillionsInFreeMedia.com! Thanks for the great information, Leslie! Perfect timing for me. I’d love to have you as a guest on my podcast: 90 Days to Abundance – where I teach my audience how to save and earn more money while creating more abundance in life. Hey Leslie, that’s a great post. Funny enough, Im thinking to go into opposite directio. I still have a Getresponse account but I have just setup another aWeber account with an intention to transition over from my GR account. Main reason is that I want to be able to do stuff that aWeberProtools lets you do. I can’t afford to be paying InfusionSoft or Ontraport fees (it simply is not justifyable right now), but I was under impression that using aWeber AND aWProTools one can pretty much get close to that (regarding the flexibility in what-if scenarios of sending out emails and segmenting prospects) for much lower cost. What bothers me with GR on this regard? 1) You can ONLY setup a rule “if subscribed-then remove”, but you CAN’T setup a rule “if subscribed-then copy”. And that’s practically the only useful automation rule that I can set in Getresponse. Pretty limiting. 2) I haven’t been able to find a way, how can I set the Getresponse in a way so that when Autoresponder_sequence #1 runs out, the GR would automatically (!) start the Autoresponder_sequence #2 and so on in a cascading fashion. Sure, you can trigger another autoresponder if a user clicks (or opens), but you can’t (at least that’s my experience) define what shall GR do automatically if the user doesn’t do anything and the autoresponder runs out. There is no automatic way to cascade the autoresponder sequences. Or is there? There definitely are limits to what GR can do, as with any autoresponder. 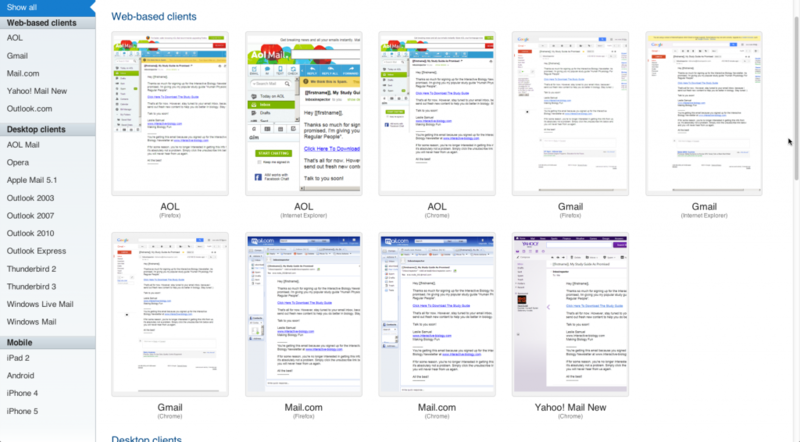 For me, I still want to use only one platform for my email marketing. I don’t want to have to use Aweber directly for some things and then AW Protools for others. 1. In terms of automation, these are the things they allow – remove on sale, move on sale, remove on remove, remove on subscribe, and preload on change. They don’t have “if subscribed then copy”. However, I’m not exactly sure what situation I would use that in. 2. The one thing I don’t like about their action based autoresponders is like you said – you can only have it do things based on action, not inaction. You are correct there. Depending on what you’re looking for, you might need a more robust system. However, for what I do, GR works just fine. It’s all about finding what works best for you. Oh heyy Josh. Yes, I did see that you signed up. I’d be happy to be on your podcast. I was actually going to just reach out to you to thank you for signing up. Will be contacting you pretty soon here. Awesome stuff. All the best with your new blog. It’s funny because I switched to Aweber and switched right back lol. I did like their commission pay out vs. Awebers as an affiliate marketer, but it was so confusing to switch between the platforms! I do like some of their features but Awepber has started to step their game up so we’ll see. Yep, Aweber has definitely stepped up their game, but I just love GetResponse much more. Great comparison, Leslie, thank you! I’ve also been debating switching to GetResponse from aweber. Do you find any difference with deliverability between the two? That’s a very difficult question to answer. I’ve heard people say that GetResponse’s deliverability is awesome. Others say it’s bad. I’ve heard people say Aweber’s deliverability is awesome. Others say it’s terrible. I can’t really give you an objective answer to that. The fact is that deliverability isn’t perfect on any of these services. However, it’s pretty good overall. So I made my decision to switch based on features that I find useful. Hope that helps. If you have any other questions, don’t hesitate to reach out to me. Gotcha. I haven’t noticed a difference, but I was bouncing around. I went from Aweber to Infusionsoft to GetResponse. I honestly don’t remember what I was getting with Aweber. I think I saw a slight decrease between InfusionSoft and GetResponse but I can’t say for sure. However, InfusionSoft is on a totally different level. Also, one of the things that people don’t realize is that they use different processes for calculating open rates. That’s something that the CEO from GetResponse pointed out to me. There are different tweaks that they all do to their calculations. I don’t fully understand it, but I’ve been pretty pleased with what they offer. Haha, yep – they have some pretty cool stuff. Let me know how it goes for you.